Papua New Guinea’s Prime Minister says Defence Force soldiers will be deployed in parts of the Hela region and Porgera to assist police curb rising lawlessness in those areas. Illegal and unlawful behaviour of individuals and groups in Tari and nearby areas have disrupted early works associated with the PNG liquified natural gas project. On Thursday, hundreds of illegal miners converged on the Porgera mine, attacking workers and damaging equipment there, halting operations at the open pit mine. In a statement, Prime Minister, Peter O’Neill, says it is totally unacceptable that law and order has broken down in those areas. Mr O’Neill says such behaviour has placed the lives of innocent people at risk, and disrupting work at the LNG project and operations at a mine that is a key contributor to the national economy. He says the government cannot sit back and allow hooligans in the community to threaten and disrupt normalcy, and place vital economic projects at risk. Peter O’Neill says no criminal behaviour that threatens the well being of the country will be tolerated. Philippine communist guerrillas warned three mining companies Wednesday that they may be attacked again if they continue to use methods the rebels say harm the environment. New People’s Army regional spokesman Jorge Madlos said the nickel mining companies in remote Claver town in southern Surigao del Norte province have refused to discuss the guerrillas’ concerns about the environment and the treatment of mine workers. Mining officials have denied the rebel allegations. Military spokesman Col. Arnulfo Marcelo Burgos said attacks by more than 200 guerrillas on the sprawling mining compounds last October were part of extortion attempts. Government forces have bolstered security at the mines, he said. The Maoist guerrillas disarmed guards, briefly held company staff, and burned company offices and heavy equipment during the Oct. 3 attacks, one of the largest rebel assaults in recent years. One of the companies was forced to temporarily shut down its operations. Madlos acknowledged the rebels wanted what he called “revolutionary taxes” from the mining companies but said the attacks were primarily sparked by their concern over mining methods that have allegedly caused sea and land pollution in Claver, about 430 miles (700 kilometers) southeast of Manila. The New People’s Army, which is listed by Washington as a terrorist group, has staged smaller attacks on mining companies and banana plantations in the south in the past, accusing them of exploiting the country’s resources and workers. The rebels are estimated to number slightly more than 4,000. Peace talks with the guerrillas stalled last year after the government refused a rebel demand for the release of several of their captured comrades. The Marxist insurgency, one of Asia’s longest-running, has been weakened considerably by battle setbacks, surrenders and factionalism but remains the country’s leading security threat, the military says. 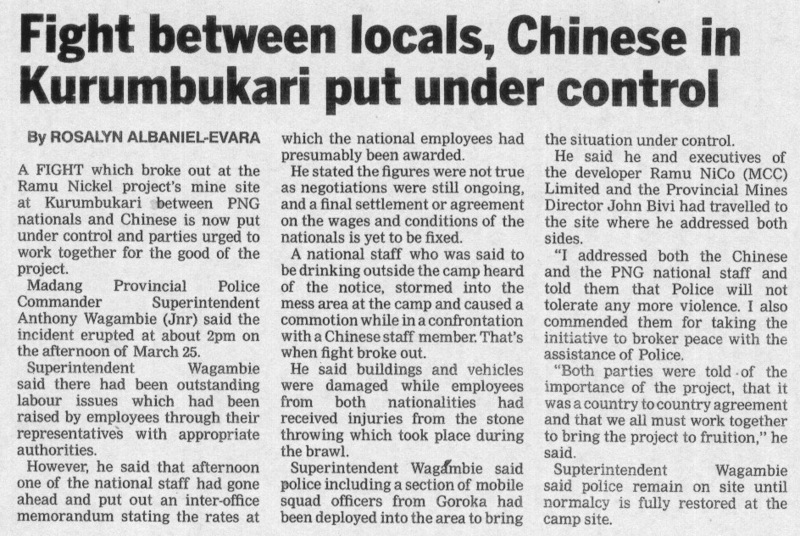 ONE of the country’s biggest gold mines was yesterday raided by an unruly mob who went on a rampage injuring employees and damaging equipment, reports The National. Mine workers were injured and three were taken hostage as scores of illegal miners went on a rampage through the open pit early yesterday morning. The three workers were later freed, with one sustaining serious injuries. Substantial damage was done to mine equipment although no estimated cost has been released. Walker said: “We have reported this serious incident to the government and to police. We are calling on them to act swiftly to restore law and order in Porgera. There is no excuse for the illegal and violent behaviour of these trespassers – they place our employees and themselves in grave danger when they act outside of the law in their attempts to steal gold from the mine,” Walter said. “The actions of these illegal miners have an impact on Porgera, Enga and PNG. We can’t allow criminal to take control of the area. The New Ireland provincial government will not tolerate the continuous negligence by Allied Gold Plc and the national government in dealing with environmental and other problems at the Simberi Gold mine, a spokesman says, reports The National. Mining chairman, Marius Soait said the landowners of Simberi and Tabar islands and the people of New Ireland were extremely upset over the reported dumping of toxic waste in a pond on Jan 24 when the tailing system pump was out. “The alleged spill is the second in the waters of Simberi Island in one year, following the cyanide spill in 2011,” he said. He said the provincial government had made it clear it wanted Allied Gold removed because it had failed to adhere to its responsibilities under the mining agreement and the MOA, it had brought in mercenaries from Fiji and had “acted irresponsibly and in violation of national mining laws and regulations”. He said the provincial government was disappointed at the failure of the national government to act decisively given the poor performance of Allied Gold. “The state should be showing the way in protecting the people of Simberi, New Ireland and PNG, instead they seem to be turning a blind eye to repeated violations of laws and regulations. Governor Sir Julius Chan has initiated a full revision of the Mining Act 1992, a motion which has been introduced to parliament since 2009 and is still pending. The current act gives outright ownership of resources below six feet to the state, but the motion recommends the act be amended to return ownership of those resources to landowners who originally owned them. The provincial government is pushing for a substantial increase in revenues from the mine for the landowners, the LLG and the province as well as sharing benefits with non-mining provinces. “It is time for the minister responsible to protect and take care of the people,” he said. Attempts to get comments from Allied Gold have been unsuccessful. A new NRI report based on a case study on the Porgera Gold Mine has highlighted the need for a probe into the current payment system. The report by Peter Johnson recommends the need for EITI (Extractive Industries Transparency Initiative) to look at the flaws in the current payment system and pave way for transparency. Mr Johnson also believes that there is a need for the education of landowners and women especially in finacial literacy so they may be able to positively care for their families. The report looks at Relations between the Memorandum of Agreement, financial benefit from the mine, institutional structures and development outcomes which could answer the question of why Papua New Guinea is resource rich yet its citizens are poor. The report also suggests a model on how to approach landowners and development issues in future resource ventures such as the LNG Project. It also looks at the original Pogera mine agreements and over a period of twenty years of commercial activities; how well these agreements were implemented. NRI Director, Thomas Webster also highlighted the need for a probe, illustrating some of the issues in Pogera and other mining townships. He brought to light the mentality of the people and their carelessness towards handling huge amounts of money without investing them for the future despite receiving regular handouts from mining companies. The report emphasises that PNG has the expertise and resources to develop strong policies to ensure transparency and accountability. Dr Ila Temu, President of the Chamber of Mines and Petroleum thanked NRI for pointing out these issues and then going on to conduct a case study that will be able to improve them. Audited payments made by Porgera Gold Mine to the Government and various stakeholders can be tracked, but not after they had reached the Government. There remains a critical lack of transparency at both the National and sub-national government levels where the impacted communities who are supposed to be the ultimate beneficiaries of PNG’s mining and mineral wealth are let out. He was speaking at the launch of a case study yesterday at NRI titled, Lode Shedding: A case study of the Economics Benefits to the Landowners, the Provincial Government, and the State from the Porgera Gold. Mr Johnson said it was easy to track funds coming from the mine and going into the National and the provincial Government but how and where it ended up from the provincial government to the local level government and the development authorities in this case, the Enga Provincial Government (EPG), Porgera Development Authority) PDA) and Porgera Local Level Government (LLG) respectively were untraceable. The report has indicated that to date over a billion kina in cash and benefits have gone out of Porgera mine yet not being translated to real developments. He said the amount of funds held in trust accounts was more difficult to estimate as well as investment made by Kupiane Investments. This, he said, was even more difficult to trace except for an initial endowment of K9 million in 1997 while the study could not find information on the current state of the benefits or how those payment were distributed. The reports indicated that from the start of the mine in 1990 till 2009, the National Government received over K3.4 billion in income tax, company tax, customs, fuel levy, business contracts, education and other measures.